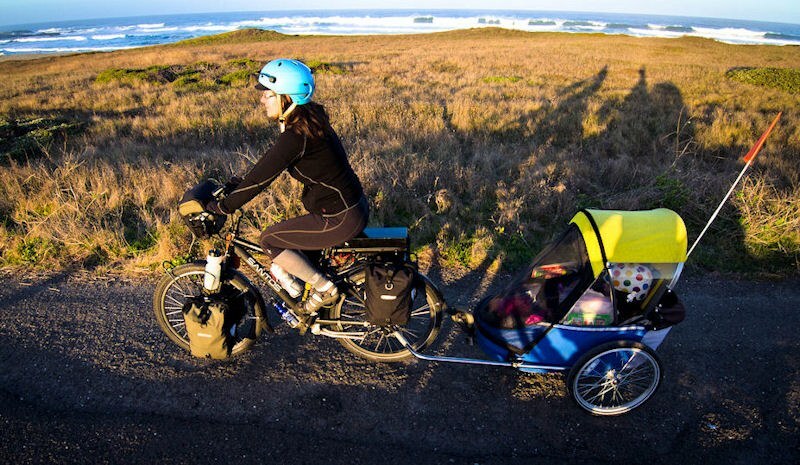 Bike trailers are the most popular way to bike with young kids and babies–and for good reason. 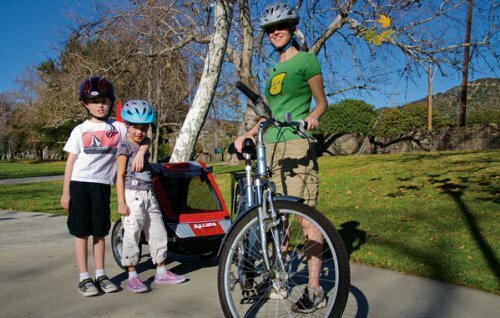 Bicycle trailers can carry multiple children, gear, and even kid’s bikes. 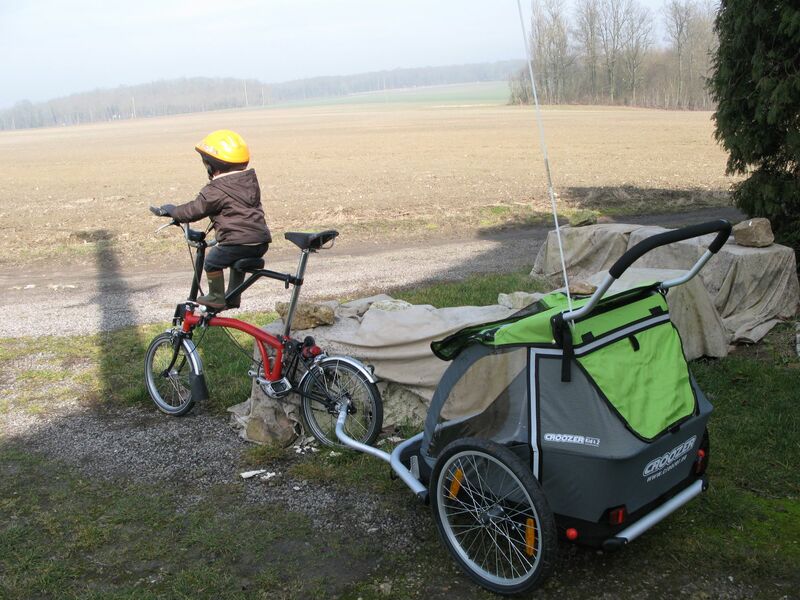 Many trailers are convertible for use as jogging strollers which makes them a good investment for active families. Finally, trailers are often safer than bike seats; in fact, a good bike trailer acts as a roll-cage. 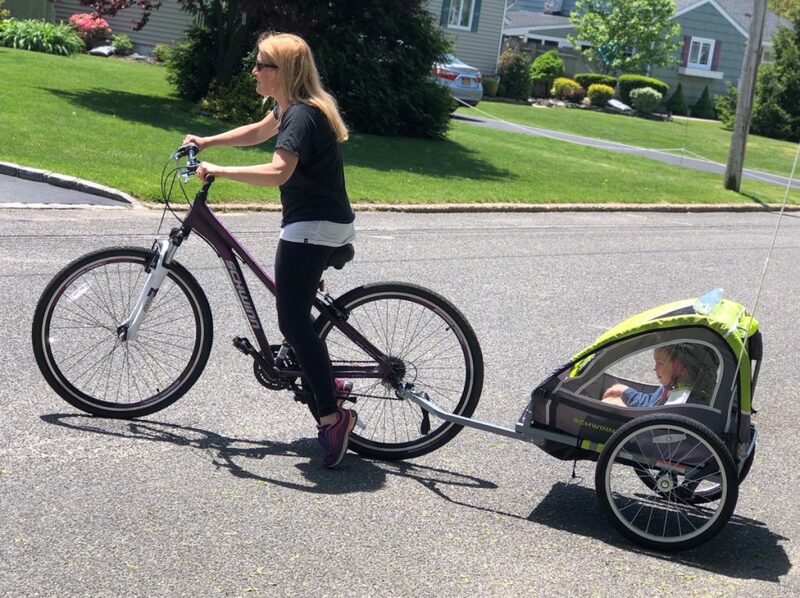 Of course, there are cons to using a bike trailer for kids as well; the biggest for me personally is the lack of interaction you get with your child. 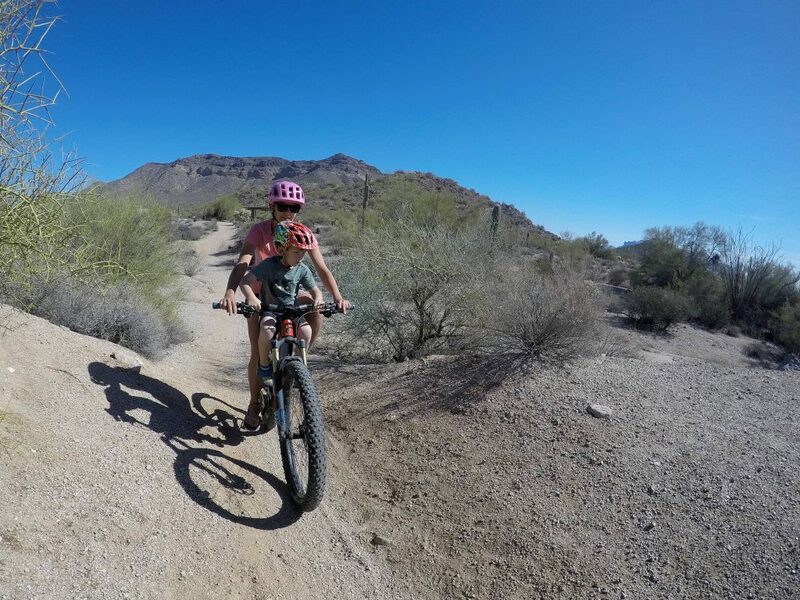 Still, bike trailers remain one of your best options for biking with kids. Below I’ll discuss how to choose a bike trailer, situations where you might want to consider another choice, and which trailers are best. The first and most obvious criteria to choose a trailer based on is whether you want to use it for one child or for multiple children. Even if you don’t have a second child yet, if you plan to have one soon, you might want to invest in a double trailer. You can always use a double trailer for a single child. The disadvantages of a double trailer compared to a single trailer is that it is harder to maneuver through tight spaces and it is heavier than a single. For this reason, I always recommend parents of only children to stick with a single trailer. Still, if you need to carry multiple kids, it is a no-brainer to immediately look for a double trailer. One thing to look at is the weight capacity. Even though a trailer is listed as a double-trailer it may have a maximum weight capacity is that too low for your two children. Lower-end trailers tend to max out at 80 pounds while more expensive trailers usually accommodate up to 100 pounds. If you like to run as well as bike, then a trailer is an obvious choice. 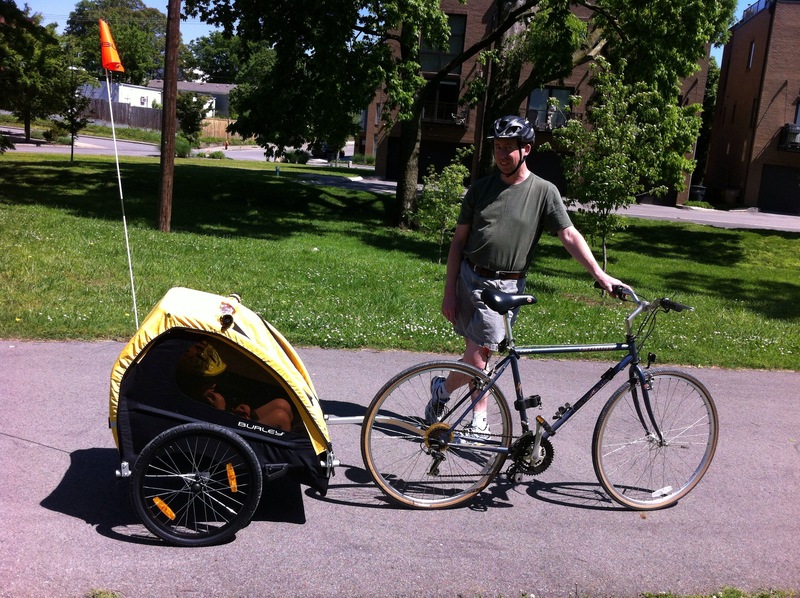 Rather than buying separate gear for each activity, choose a bike trailer that can act as a jogging stroller as well. Some trailers, like the Thule Chariot, can even be used for cross-country skiing or fat-biking. 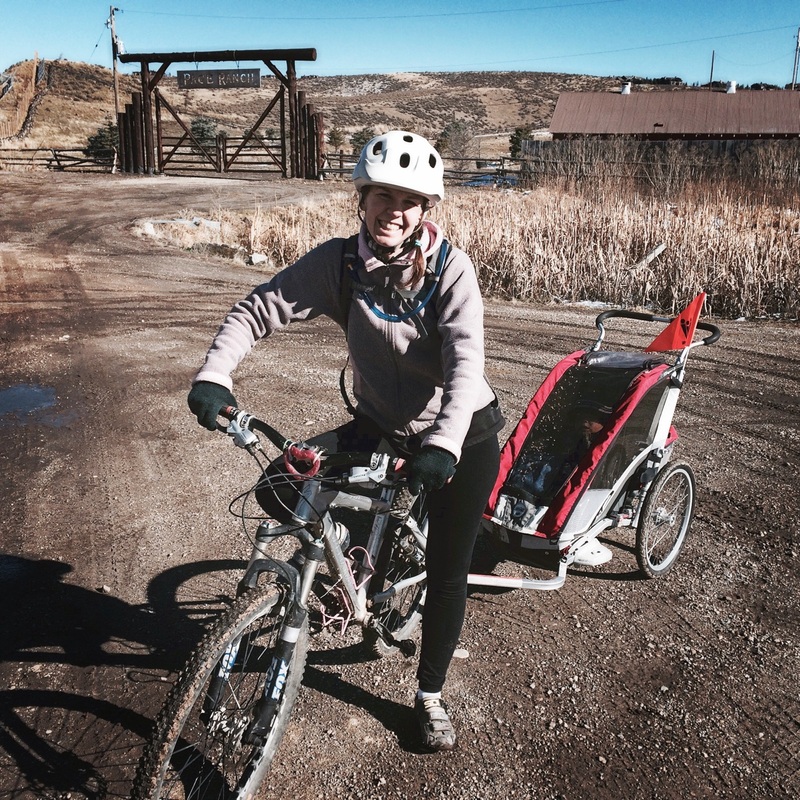 If you are looking for a trailer for bicycling only, then skip the convertible trailers. They are more expensive. Bicycle trailers cost between $100 to $1,000 which is a pretty big budget range. As with most things in life (unfortunately), the more expensive the trailer the nicer it is going to be and the better the construction is. Trailers on the lower end are not as comfortable or as durable as more expensive trailers. That said, if you are looking for a way to haul your child on the occasional paved bike path ride, a $100 trailer may be sufficient. At the high end of the price spectrum, a $1,000 trailer will have suspension, durable fabric, good ventilation, lots of storage, and plenty of other perks. If you can afford it, go for it. Most families will be best served by a trailer somewhere in the middle. We’ve tried including a variety of price points in our top picks below. Whether or not you need is suspension is largely dependent on the type of riding you plan on doing. If you are going to be largely primarily on paved bike paths and other smooth surfaces, you can probably forgo the extra expense of suspension. On the other hand, if you plan on riding off-road on gravel rail trails or forest service roads, suspension is a must. Even on uneven city streets, having suspension can make a big difference in the comfort and enjoyment for your child. I like a lot of storage space in my bike trailers. As parents, we have all sorts of stuff that needs to come along — diaper bags, toys, snacks, balance bikes, etc, etc, etc. I also like being able to pick up a bag of groceries or some library books. If you plan on being a frequent bike commuter with your trailer, look for one with plenty of cargo space. A good rain cover has saved me time and time again. My son has survived some long, cold, snowy bike rides in a trailer with a sleeping bag and the rain cover safely secured. If you plan on riding in inclement weather conditions, take this seriously. On the other side of the spectrum, sunny rides are much more enjoyable with a shade cover to keep your little ones protected. Not all trailers come with these things, so evaluate your needs before shopping. All else equal, look for a trailer with the lowest weight. 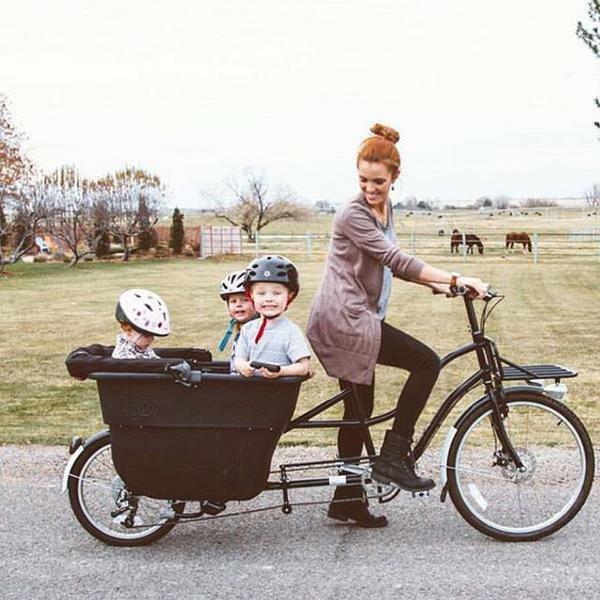 Carrying kids in a bicycle trailer is heavy and hard; you don’t need to make it even tougher on yourself by hauling a heavy trailer too. 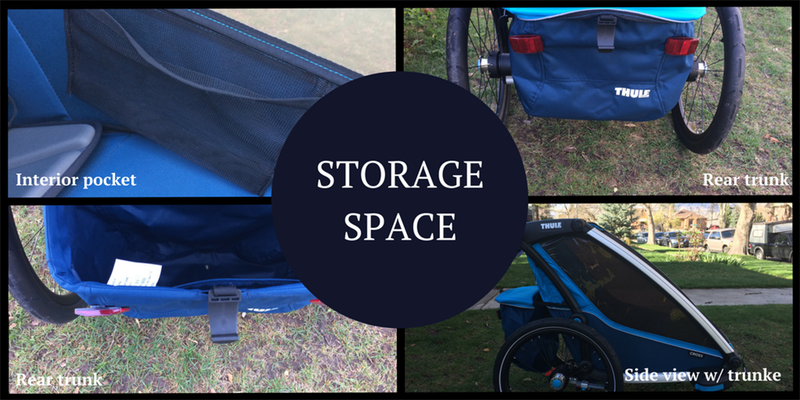 If you are interested in using your trailer to bike with a baby, choose a brand like Burley or Thule that offer inserts for carrying infants. As an alternative, you can buckle a car seat into a trailer as well. Compared to child bike seats, trailers tend to be safer. A good-quality trailer is essentially a roll-cage providing protection to your child in the event of a crash or a tip-over. With a bike seat, on the other hand, if the parent crashes, the child is crashing too. That said, I still prefer a bike seat (especially a front-mounted bike seat) to a trailer–although I use both. This is because with a bike seat you have your child close by where you can talk to and easily interact with them. In a trailer, it is much harder to see and hear how your child is doing. When we use our trailer, we often have to pull over and stop to help our son or to hear what he’s saying. A bike seat is also much lighter than a trailer, which can feel awfully heavy when you are climbing hills. In terms of cost, a trailer falls squarely between a bike seat and a cargo bike. While a good-quality trailer can be quite a bit more expensive than a bike seat, it is still much cheaper than a cargo bike. A cargo bike is awesome if you can afford it, and if you are going to be commuting on a daily basis. If you only plan to do the occasional bike path ride or cruise to the park, go with the trailer. Finally, trailers tend be best for use with young kids. If you are comfortable with it, you can even buckle a carseat into a trailer. For parents of multiple young children, a trailer is often the ideal option as you can put two kids in there. Unfortunately, for slightly older kids the trailer quickly becomes BORING. If you have a child 3 or up, I much prefer a trailer-cycle, where they are able to pedal along. 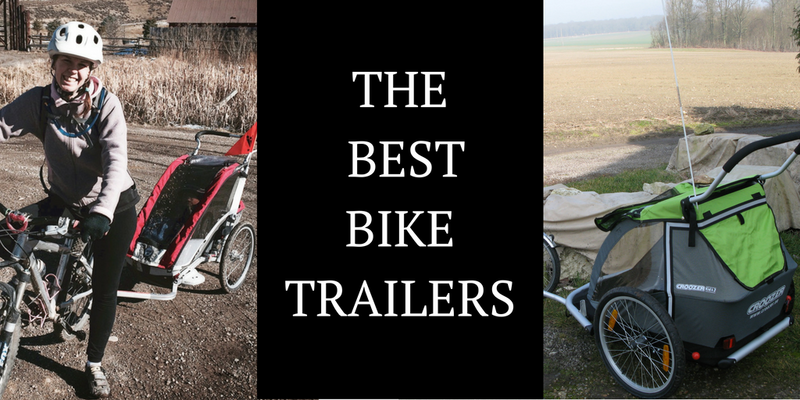 Here I offer up what I consider the seven best bicycle trailer brands. Each of these brands offer models that range from no-frills to all the bells-and-whistles. Regardless of the model that you choose, you can assume if you are buying a trailer from one of these brands it will be a quality product. Scroll down to see our comparison chart with different models from each of these brands. No doubt—the Thule bike trailers (particularly the Thule Chariot) are the nicest trailers on the market. The Thule Chariot is the very first thing I bought when I found out I was pregnant. These trailers are the crème de la crème for active families thanks to the multitude of available accessories. 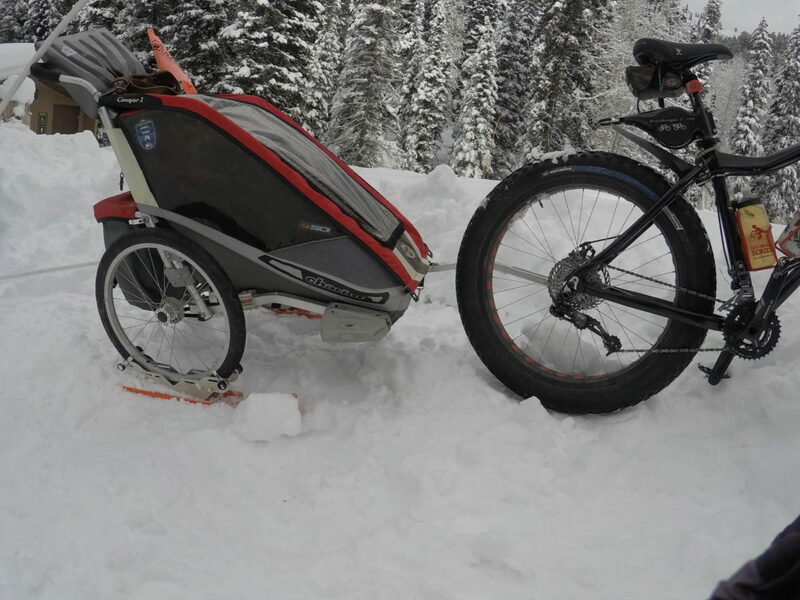 The trailer can do double duty as a stroller, jogger, and ski sled. The more expensive models have suspension for off-road riding, plenty of storage, and will last for years. For more information, read our detailed reviews of the Chariot Cougar or the Chariot Cross. 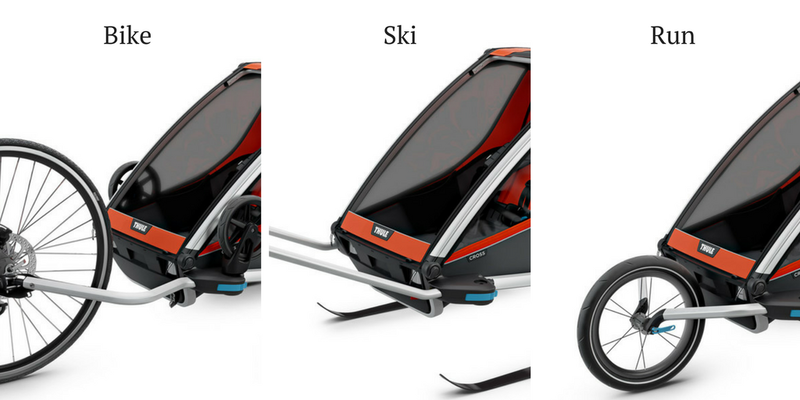 Like Thule, Croozer offers multi-sport trailers for parents that want to do it all. But unlike the Thule Chariot trailers, you don’t have to buy any accessories. 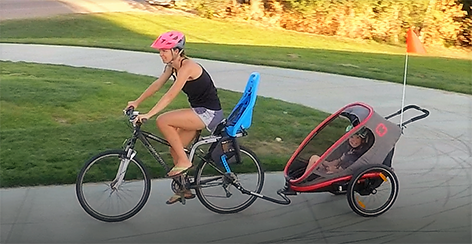 All Croozer trailers include the trailer kit, jogging kit, and stroller kit, making them a great deal. That said, the Croozer trailers do tend to be a bit heavier than their Thule counterparts. When thinking of bicycle trailers, Burley is probably the name that comes immediately to mind. Known for high-quality products and good value, Burley deserves their positive reputation. They offer trailers across the budget spectrum, from bare-bones entry-level trailers that still boast good quality to high-end trailers with adjustable suspension. For more information, read our reviews of the Burley Solo or the Burley Cub. The Allen Sports trailers lack some of the bells and whistles that the brands on this list have, but they do come at a totally affordable pricepoints. Unlike other “cheap” trailers, the Allen Sports trailers are lightweight and easy to pull. If you’re on a budget, or only plan to use your bike trailer occasionally, look no further than this top pick. Unlike any other trailers on this list (or in the U.S. market for that matter), Wike trailers have a unique look and serve as the ideal trailers for families who like to do lots of around-town riding and commuting. The Wike trailers are durable, comfortable, and heck, they look nice! We also appreciate that these trailers fold up small, making them nice for storage and transport. 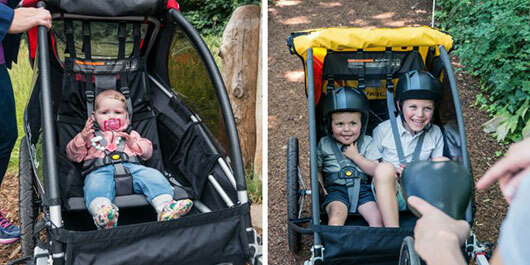 You’re probably familiar with Hamax carseats, but the Norwegian company also makes great bike trailers. In fact, we’ve found that the Hamax trailers offer superior quality at a reasonable price. If you’re looking for a multi-sport trailer, we especially like the Hamax Outback. For more information, read our detailed review of the Hamax Outback. Chances are you had a Schwinn bike as a kid. Yup, that’s how long this company has been around. If you’re looking for a basic, budget trailer that will get the job done, consider a Schwinn. You won’t find any bells and whistles on these trailers, but they won’t fall apart and they don’t weigh a ton. To compare brands and models, use this handy chart to help you choose the best trailer for your family.